The Abarth Scorpion is a symbol of speed, performance, and athleticism. It was also the astrological sign for a man named Karl Abarth, who in the 1950s took a regular Fiat, tweaked it, and raced it to the top of the motorsport podium. Over a seven-year run, he broke six international speed records with his Fiat 595 Abarth and accumulated more than 900 overall victories. And lying before me here is his legacy and the modern iteration of the Fiat 500 dressed up in a chili pepper tracksuit. This ladies and gentleman, is the 2015 Fiat 500c Abarth. 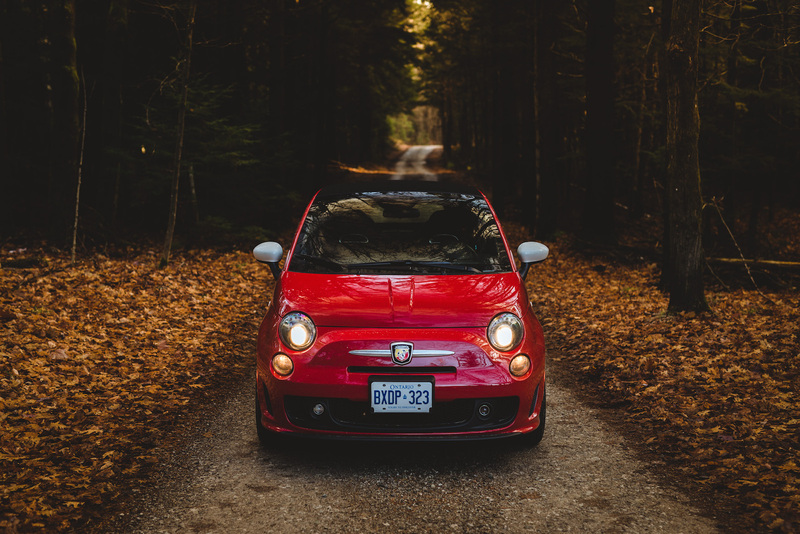 The modern Fiat 500 has been around for quite some time but new for the 2015 model year is a six-speed automatic transmission and a new 7-inch driver instrument cluster. The purist-robbing automatic is an appealing option that aims to broaden the customer base, and the new gauges beautifully display every driver read-out you require. The upcoming 2016 model is going to add on a new center infotainment system as well, replacing the current digital strip that looks like it’s been ripped off an old radio. At least then, you won’t have to keep a spare TomTom in your glovebox. 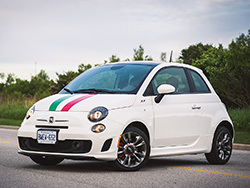 The Abarth keeps the same cute face for 2015 loaded up with a dozen air inlets on the front fascia to maximize airflow into the intercoolers and a cloth-top-mounted rear spoiler for some extra downforce. Our specific test vehicle donned a striking red paint with white ceramic wheels – it’s a combo that hits both sides of the adorable and aggressive spectrum. The Abarth logo is also one of my favourites in the automotive industry, reminding me of a Rad Scorpion from Fallout dressed in Italian colours. And that’s a good thing because I spot a total of 8 scorpion logos on the outside alone. Under the hood is the same 1.4-litre MultiAir turbocharged inline-four engine found in the regular 500 Turbo but it’s been tuned to produce more power. 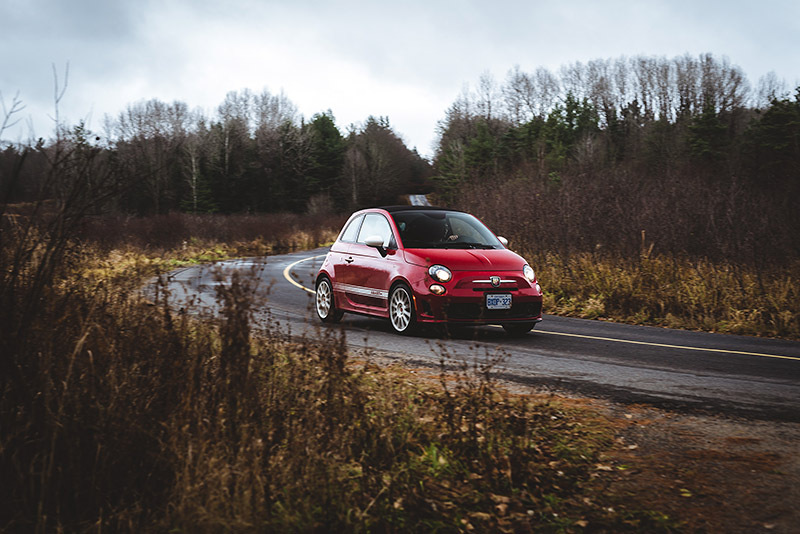 Not only does the single turbocharger provide more boost, but the Abarth also makes use of two intercoolers located behind the driver and passenger side air inlets to remove excess heat. The result? A grand total of 157 horsepower and 183 lb-ft of torque from this modest little engine. It’s a highly respectable output that makes the most out of meager displacement and a tiny footprint. 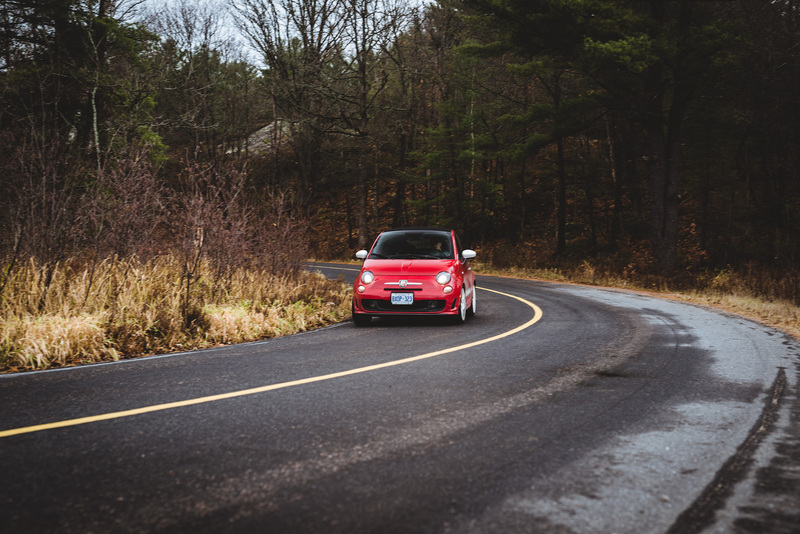 Over the regular Fiat 500, the Abarth also receives a stiffer and more rigid suspension, a lower ride height, and bigger brakes. Of course, the big news this year is the optional 6-speed automatic ($1,495) that sends power exclusively to the front wheels. The new slushbox deletes a bit of traditional driver engagement by replacing the 5-speed manual shifter with one that says PRND, but this new AISIN automatic makes its case and wins me over. It’s brilliantly tuned, loves to downshift to the right gear and even auto rev matches when you do so. If you feel so inclined to row your own gears, you can push the gear lever to the left to select manual shifting. Oh, and Sport Mode is hilariously enjoyable. It comes standard on all models and unleashes a more aggressive throttle map for a quicker engine response. It also holds the gears longer and sharpens up the steering. In addition, fuel-cut upshifts, rev-matching downshifts, and brake-assist downshifts are all done for you, making you look like a pro behind the wheel. And isn’t that what we all want from our track cars? I’m not sure why they needed to incorporate a Sport Mode though. In my opinion, the Abarth should always be in Sport Mode, but I guess they had to make it a usable everyday car too. If you look at the spec sheet, you’ll notice that the automatic and manual transmissions offer different power outputs (157 hp / 183 lb-ft and 160 hp / 170 lb-ft, respectively). That’s because the new automatic gets reinforced with more clutch plates and robust heat treatment, allowing it to handle more torque but at the sacrifice of a few horsepower. The difference is hardly noticeable at regular road speeds however. 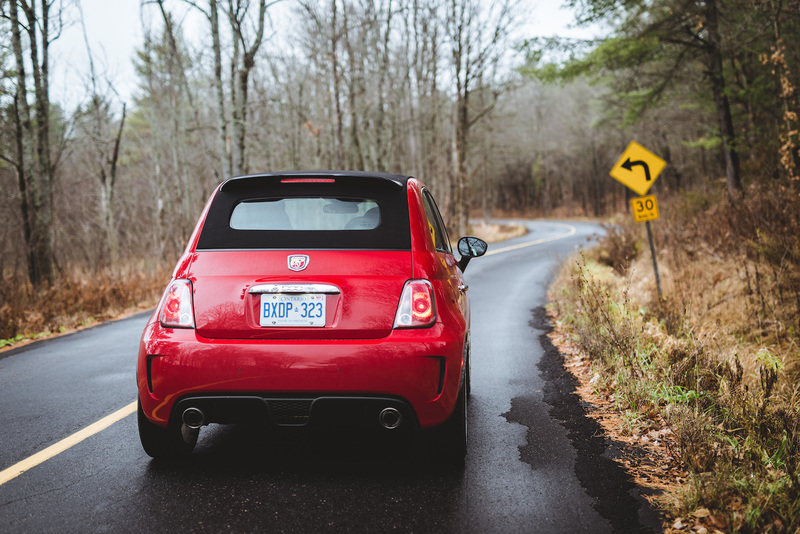 The Abarth’s most entertaining feature is its exhaust. Think of it like a pouty little kitten turned feral - best not to judge this book by its cover. 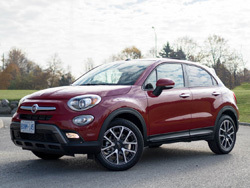 If you heard this noise speeding about behind the trees, no way in hell would you guess that this menacing buzz is coming from a subcompact Italian hatch. Turning the key ignites a sound that’s comparable to punching a beehive and having a swarm of bees exit the dual exhausts. It’s that loud, and rumbles and vibrates like a wannabe Ferrari. This soundtrack contributes to much of the Abarth’s character but without it, the overall car wouldn’t be as appealing. That being said, the cabin isn’t very well insulated from the outdoors, partly due to the fabric roof. There’s also a fair bit of droning from the engine at high speeds. The ride is also incredibly stiff and not comfortable by any means. The ride to the grocery store will be a bumpy one, considering your first challenge is fitting all your groceries into the peanut size trunk. 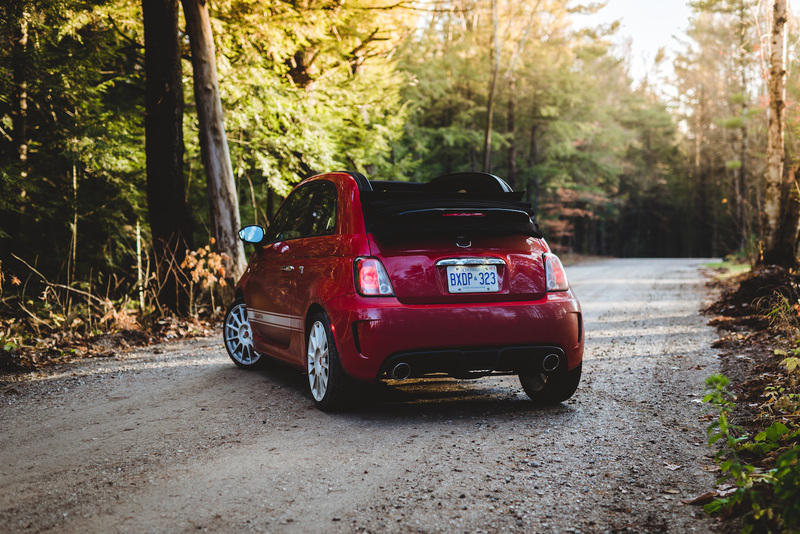 But the Abarth was never meant to be a grocery getter. That medal is saved for its 500X and 500L brethren. This little pepper was born to be a corner carver and hoon it’s way through town. 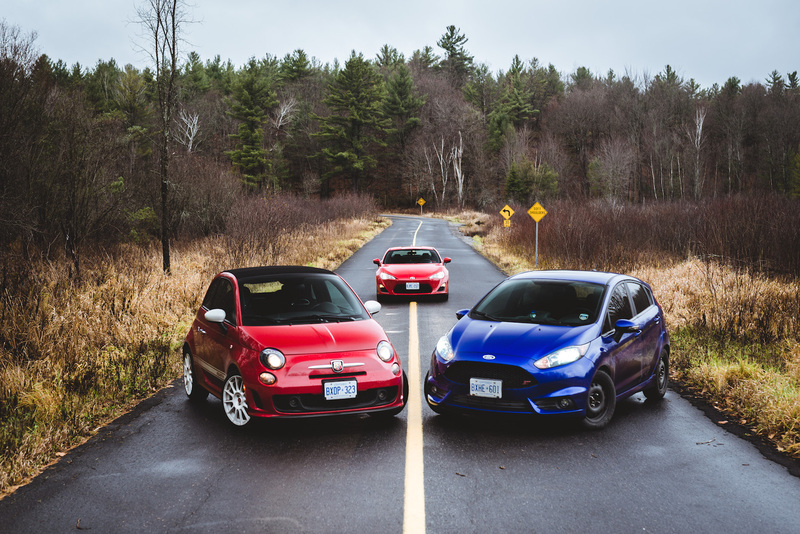 So instead of making our way to Whole Foods, we decided to take the Abarth up north to our favourite twisty roads along with some feisty company, and I’m talking about a 2015 Ford Fiesta ST and a 2016 Scion FR-S. It gets lonely up there, ya know? 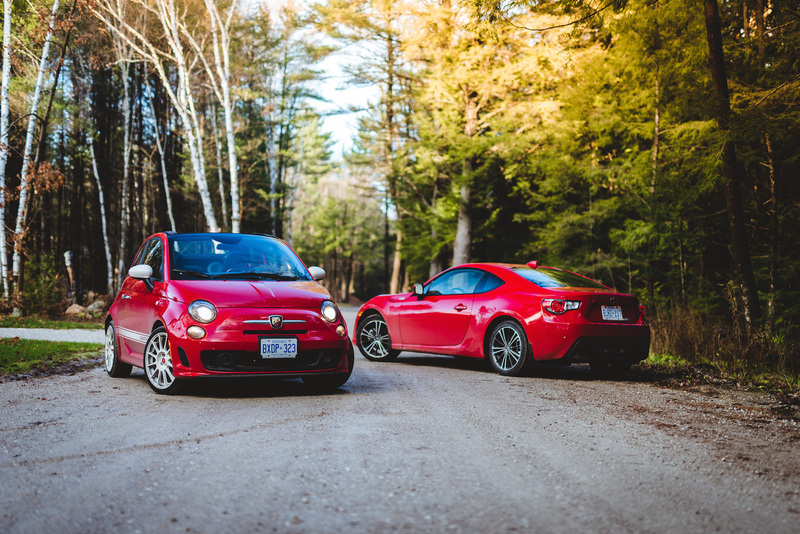 And that’s why you’re going to the see the Abarth tagged along by an entourage in the photo gallery below. The fun factor is strong with this young Padawan. 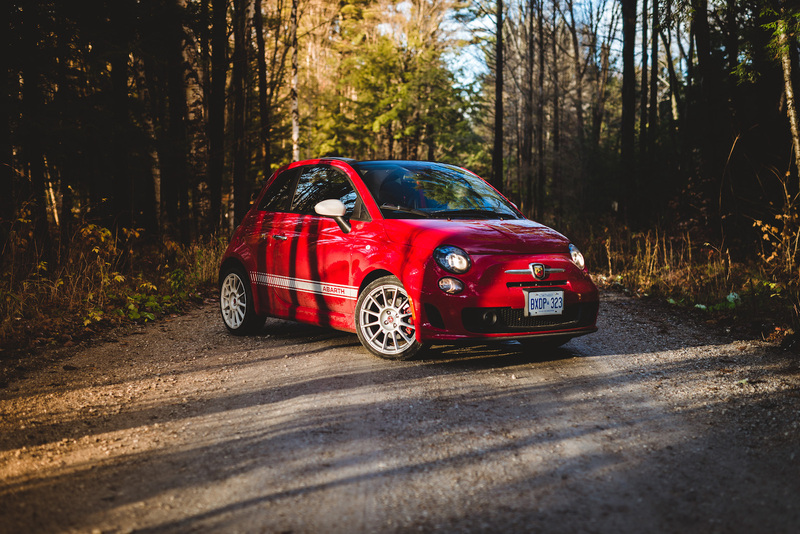 Not only did the forests echo with the Abarth’s vocal cords, but its sticky Pirelli P Zero Nero tires also felt glued to the tarmac. 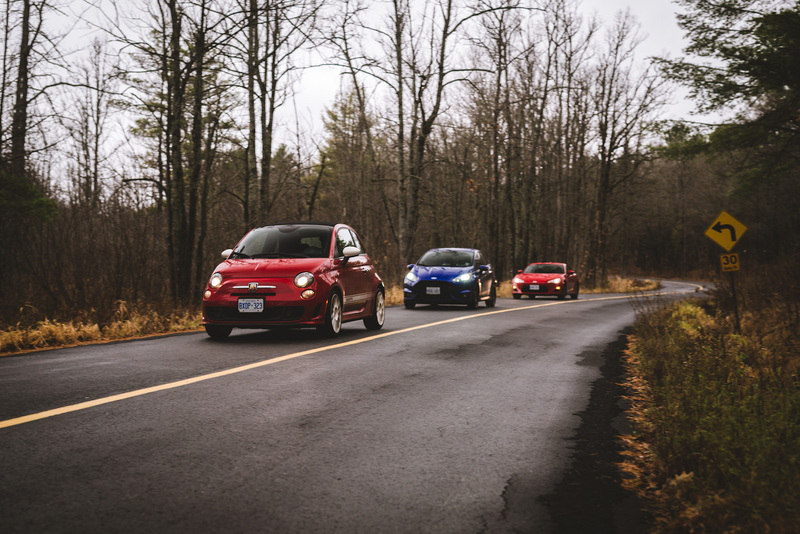 Here on these barren country roads, the Abarth finally came alive, tackling each corner after the next with an endless amount of grip. The ride wasn’t very rigid due to the shaky open-top roof, but it was largely overshadowed by its performance. 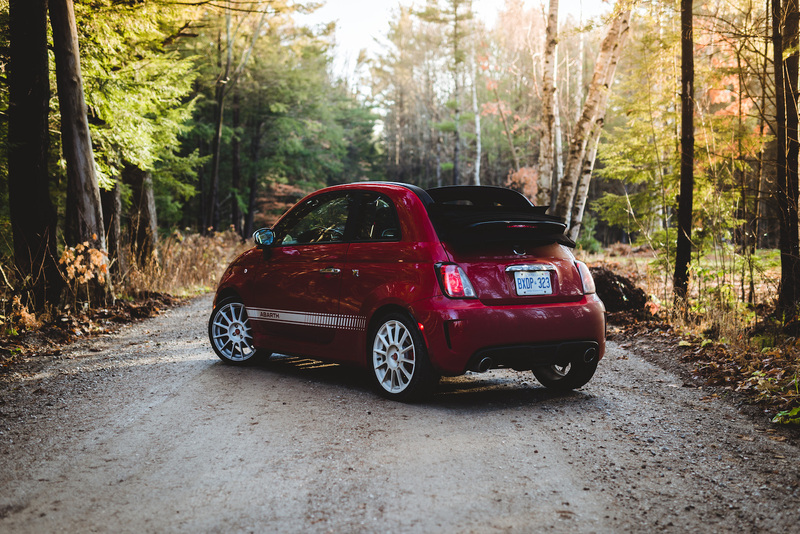 Frankly, the 500c Abarth isn’t very fast at all but it certainly feels that way with a misleading small stature and boisterous exhaust. I was skeptical at first – everybody sighed when they saw the lanky little shifter and lack of a third pedal - the Fiesta ST and FR-S were equipped with manual gearboxes of course - but after a few hours on the road, I begged to differ. The automatic performed wonderfully and its driving personality wasn’t hindered by a missing clutch. The gearbox swapped cogs faster than I ever could, and allowed me to keep both my hands on the wheel and concentrate on the road ahead. I just wished there were paddle shifters. It also gave me some extra time to feel up the interior. 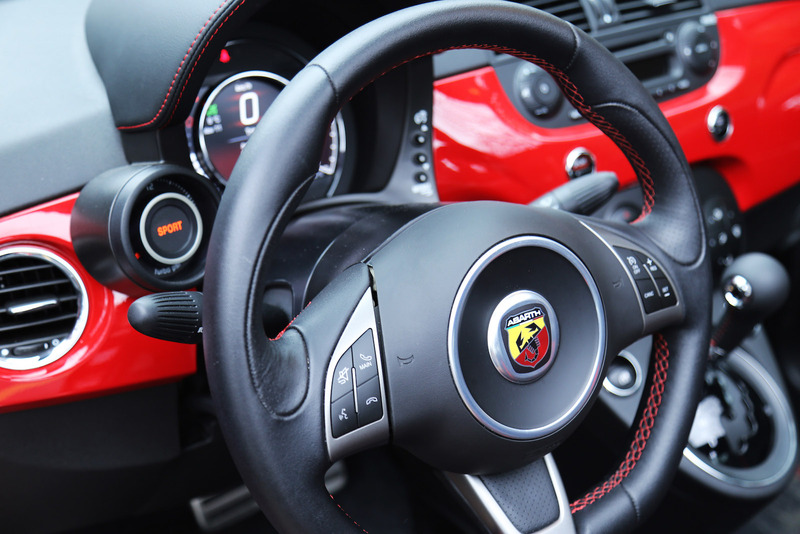 Inside the Abarth, you’re greeted with a thick rim steering wheel and a nifty boost gauge that lights up when you hit that Sport button. I wouldn’t say it’s cramped in here. 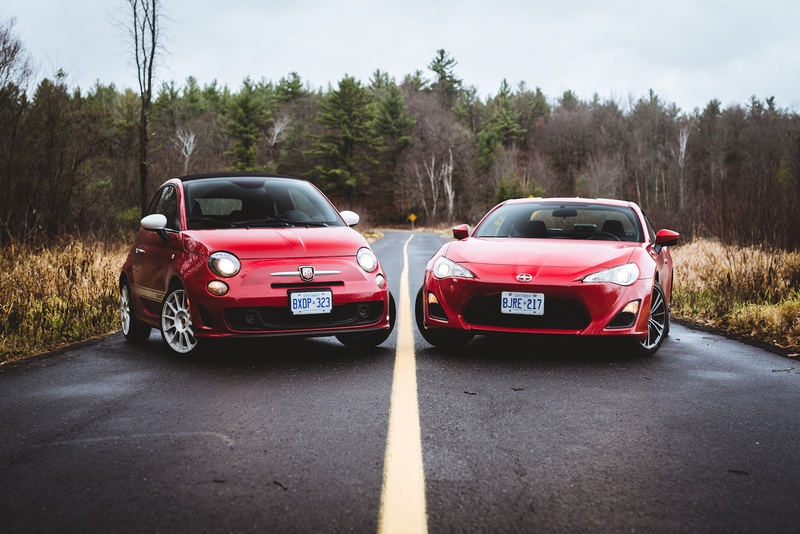 That’d be an unfair statement to the small nature of the Fiat. That’s like blaming a Chihuahua for being too small – it wasn’t born to be a German Shepherd in the first place. My opinion is that the overall cabin is very well packaged. There are even four cupholders located in the center console, though each varies in size. There is a pair of usable backseats too but these are mainly reserved for small children or luggage. The front seats on the other hand are a bit odd for people with taller torsos – the short seatback means you’ll be resting your shoulders on the headrest in place of, well, your head. I was also disappointed with the seating position. It’s the same problem I had with the Fiat 500 Turbo I tested a few months ago, and that’s because the seats were positioned way too high. This was done so that drivers would feel taller on the road and match the height of other sedans and coupes – but I wasn’t feeling it. I could never find a snug position and the non-telescoping wheel didn’t help either. Hooning around town in an awkward posture is a total buzz kill, the same kind that will get you kicked out of the house for yelling the wrong name in bed. The good news is that the roof can be opened, and there’s lots of open-top excitement to be had. 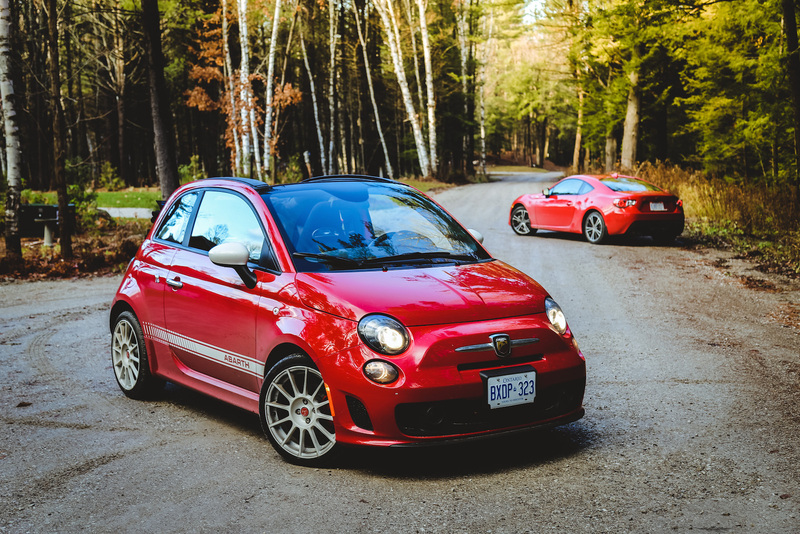 The 500c Abarth isn’t a full-on convertible per say, as it keeps its C-pillars intact. Instead, it’s almost like a large powered sunroof that folds back like a stack of Dominoes, and I love how you can put it exactly where you want it. 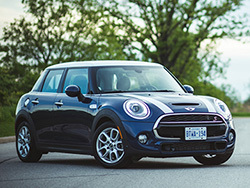 In addition, you can also operate it while driving up to 80 km/h – meaning you can pull the top down even on the highway. 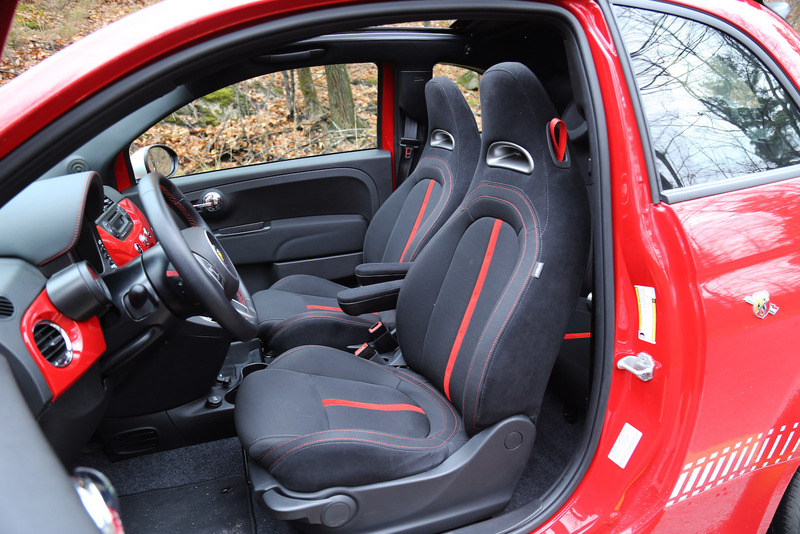 I don’t have any complaints against the Abarth other than its unwieldy seating position. 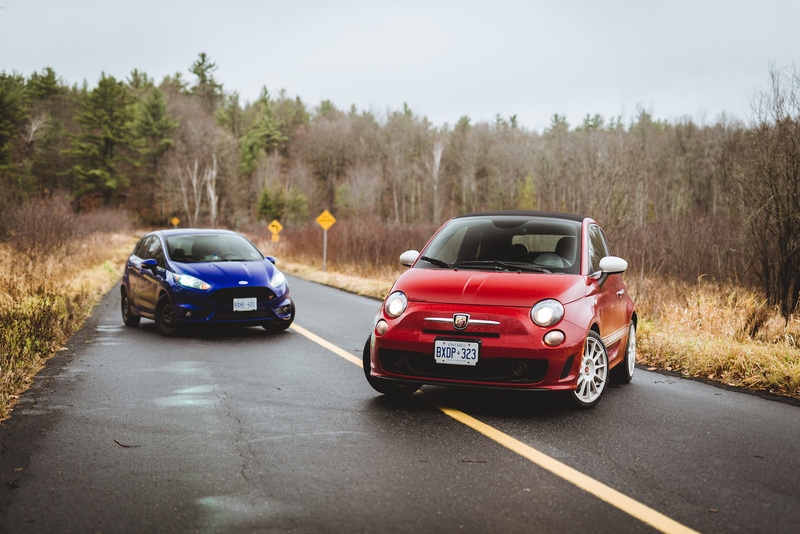 The track-oriented Fiat is a hot hatch with a stiff ride, a fantastic turbocharged engine, and cute-as-a-button looks. Though stemming on the pricey end at $33,550 as-tested, it’s beehive exhaust and charming athleticism nail it as a bargain. 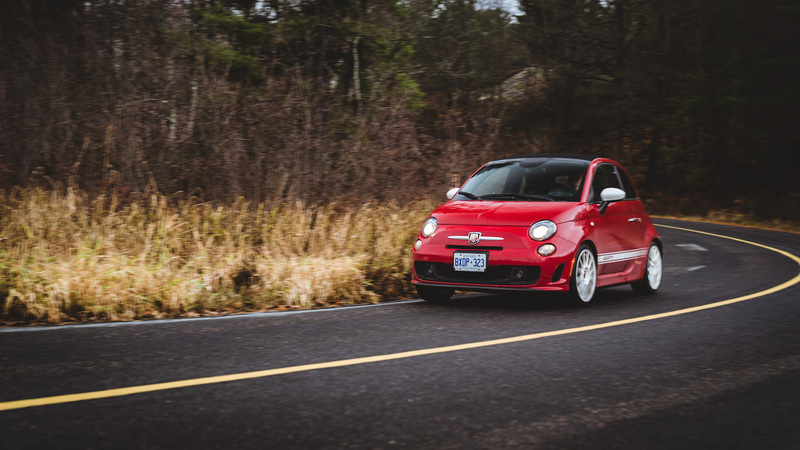 However, when it comes down to which gearbox is better, it’s helpful to understand that the Abarth’s traditional 5-speed manual is there to please the purists, while the new 6-speed automatic is catered towards a wider audience. 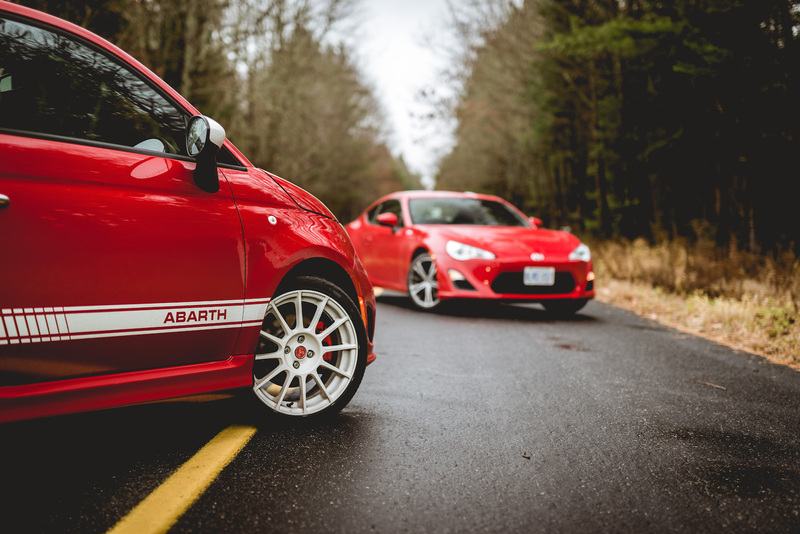 The bottom line is, you’ll have a wild and exciting time with the Abarth regardless of the transmission you choose. We don’t discriminate between having two or three pedals, and you shouldn’t either.